Kelly Gilmour-Grassam, a freelancer copywriter and founder of copywriting agency Making You Content, has been named IPSE’s Young Freelancer of the Year 2015. In celebration of National Freelancers Day, IPSE - The Association of Independent Professionals and Self Employed – held its annual Freelancer Awards. Hosted by comedian Shappi Khorsandi at The Hospital Club on the 12th of November 2015, the event saw two prestigious awards up for grabs. Bringing together a diverse range of freelancers from across the UK, the awards recognised the hard work of the shortlisted candidates. The Inspire category celebrated established professionals who have made a significant contribution to their industry and clients. Meanwhile, the Aspire award recognised up-and-coming freelancers and entrepreneurs, aged 23 and under. Kelly Gilmour-Grassam, a freelance copywriter based in Manchester, was one of the five candidates in the Aspire category. Having begun freelancing at university to supplement her studies, before writing her way around South America, she started Making You Content on her return to the UK in March 2014. Since then, her copywriting agency has quickly gathered strength. It won Theo Paphitis’ Small Business Sunday (#SBS) in August 2015, and Kelly was a finalist in the Forward Ladies North West awards this summer. Having joined the other candidates for the IPSE Awards judging day in October, she was said to have ‘blown the judges away’ when she was announced as the winner of the Aspire category on Thursday. 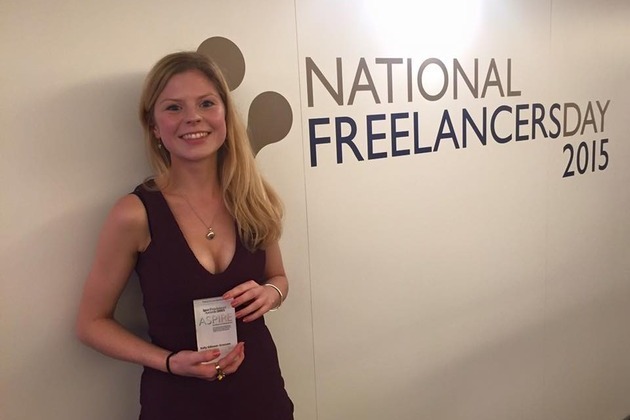 ‘It’s a real honour to be named Young Freelancer of the Year 2015. The Awards are a fantastic opportunity to give driven individuals recognition, and IPSE are helping to raise much-needed awareness and support for the self-employed,’ said Kelly. As Kelly plans to grow her agency in 2016, the exposure, prize fund, and generous support from the Awards’ sponsors will go a long way in helping Making You Content carve its niche in the Manchester – and UK – copywriting industry over the coming year.